There has been a slight revision to tonight's planned bus route. Please click here to see the new route. WE are delighted to announce that there will be and open top bus parade though the town tomorrow to celebrate the club's promotion to the Football League. The parade will be followed by a civic reception for the players at the Grimsby Town Hall. North East Lincolnshire’s Mayor Cliff Barber and Council Leader Ray Oxby will welcome the club’s players and officials to Grimsby Town Hall for the event, which will officially begin at 7pm. 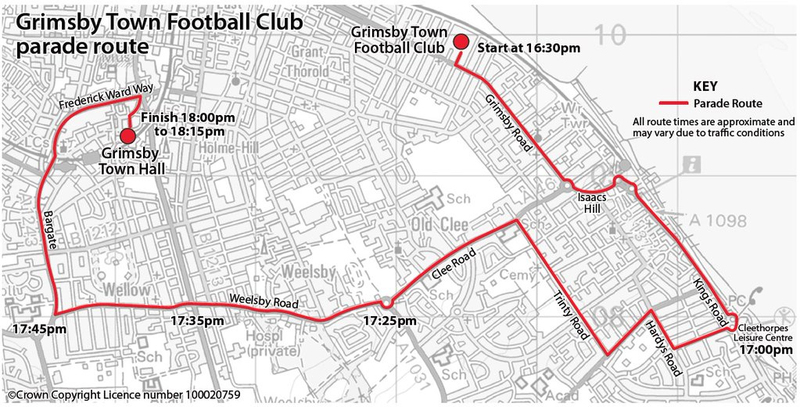 Earlier, at 4.30pm, an open top bus carrying the Mariners’ players and staff will set off from Blundell Park on a route which will take in parts of Cleethorpes and Grimsby- to allow supporters unable to get into the town centre a sight of their heroes- before arriving at the Town Hall at around 6pm - 6.30pm, where it’s expected numerous fans will gather to pay tribute to their heroes. A number of roads on the route will have to be temporarily closed during the event, and motorists in the area are being warned to expect some delays. Stewards from the club will also be assisting with crowd control during the bus ride and in and around the Town Hall. • Onto Clee Road, around the Lovelane Corner roundabout onto Weelsby Road, across Peak’s Parkway. • Right into Bargate, over the bridge and past Freshney Place continuing along Frederick Ward Way turning right down Victoria Street West and left onto Town Hall Street and the Town Hall. And Council Leader Ray Oxby added: “As a supporter and season ticket holder, yesterday was one of the best sporting days I’ve seen and it will be a pleasure to welcome the club to the Town Hall to mark their achievement. “Grimsby Town has always been right at the centre of our community and part of the area’s core- seeing them return to the Football League will not only be good for the club, but also for further raising the national and international profile of the whole area. “To be at Wembley to see Town win was fantastic- to see them return to Grimsby to be welcomed by supporters tomorrow will be equally fantastic. And Grimsby Town director John Fenty was obviously delighted with the events of yesterday and thanked North East Lincolnshire Council for their support. He added: "We've done our time, paid our penance and returned to the Football League - thanks to Paul Hurst and his lion hearted players. "This game will live with me forever, as one of the most important in the club's history. "Great Grimsby will be even Greater as its name will achieve national and international coverage, week in week out. "We're so grateful to North East Lincolnshire Council, for their support in this magnificent achievement and look forward to a tour of the town, finishing at the Grimsby Town Hall. Hope to see you all there."